The D4F engine replaced the old D7F at the end of 2000. This engine was designed, as well as all D series, for small and compact city cars (such as Twingo or Clio). The engine has the same cast iron cylinder block (crankcase). The bore and stroke did not change. All main parameters are the same. The difference is the cylinder head. It is 16-valve aluminum cylinder head now with one camshaft still. This technology advanced cylinder head helps the engine producing more power and torque, and consuming less fuel at the same time reduces the emissions. The single camshaft is driven by the timing belt. The engine equipped with sequential multipoint fuel injection. There are no hydraulic lifters/tappets. The engine requires the valve clearance adjustment every 100,000 km (60,000 miles). Renault introduced a turbocharged version of the D4F, the D4FT, in 2007. This engine is named as 1.2 TCE what means Turbo Control Efficiency. 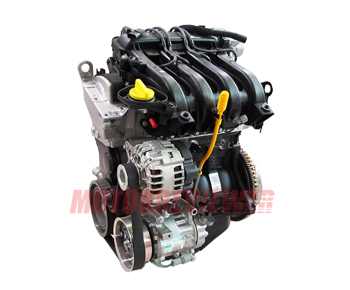 The engine has its own revised 16-valve cylinder head SOHC and reinforced components. The turbocharger with intercooler helps to raise the power and torque to the level of 1.6-liter engines. The engine is straightforward and very reliable. Like the D7F, the D4F doesn't have noticeable weakest points in the construction. Don't forget to replace the timing belt (the D4F bends valves) and change engine oil in time!